Did Sarah Palin Carry Out the Biggest Hoax in American Political History? 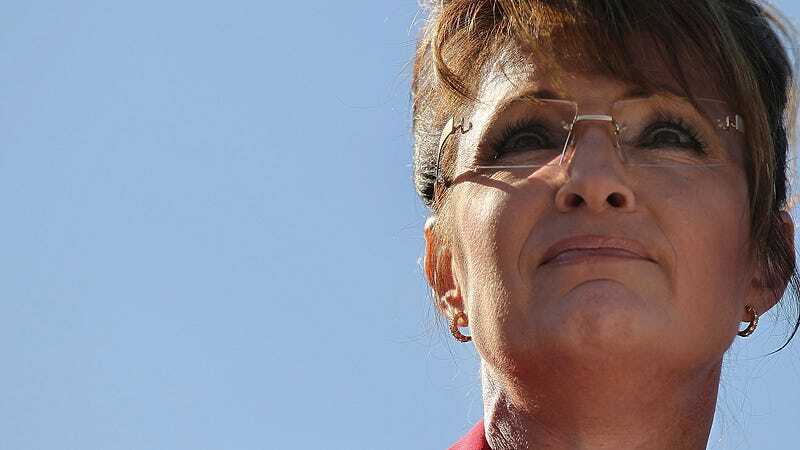 An interesting footnote has emerged to a theory that raged around the Internet during Sarah Palin's candidacy for Vice President. The theory is that Sarah Palin is actually the grandmother of her purported son Trig, not the mother, and that she staged a gigantic hoax during the campaign to cover up this fact. Professor Bradford Scharlott of Northern Kentucky University has looked into this story in detail and written a long academic article about it. He concludes two things: First, that the "conspiracy theory" is likely true—Sarah Palin staged a huge hoax, and, second, the American media is pathetic for not pursuing the story more aggressively. Scharlott's article walks through all the evidence supporting the theory, including the photos of Palin in what is said to have been a late-stage pregnancy, the leisurely 20-hour trip home that Palin took after she supposedly went into labor in Texas, the refusal of the hospital where Trig was supposedly born to even confirm that he was born there (let alone who was the mother), strange statements from Palin's doctor and the McCain campaign, and so on. And Scharlott concludes that, given that this hoax would be a massive fraud perpetrated on the entire country by a vice-presidential candidate, the media absolutely should have pursued the story more aggressively. Because the mainstream media did not—and has not—pursued the story at all (let alone aggressively), Professor Scharlott has done some of the work himself. He has also attempted to explain why the media was so wimpy and gullible during the campaign. One of Professor Scharlott's theories, interestingly, is that conservatives have been extraordinarily effective at shaming anyone who has even brought up the matter, let alone investigated it. He notes how different this is than the Democrats ability to quell the other conspiracy theory that has obsessed the nation in recent years—the theory that President Obama was born in Kenya. Given the amount of publicity (and support) presidential candidate Donald Trump has gotten in recent weeks by picking up the Obama-wasn't-born-here mantra, the silence on this other question is indeed startling. The evidence Scharlott's cites about about Palin's possible hoax is by no means conclusive, but it certainly raises as many questions as the logic about Obama's birthplace. In light of Scharlott's evidence that Palin staged a hoax, as well as the ongoing absence of any proof that Palin is actually Trig's mother, one wonders if the media will now, finally, seek to determine the truth—especially because Palin is considered a candidate for president. Republished with permission from BusinessInsider.com. Authored by Henry Blodget. Photos of Sarah and Bristol Palin via Getty Images. What’s So Special About Robert Pattinson?